You are currently browsing the category archive for the ‘Metals’ category. July 1941. A test spray was prepared by dissolving 2.5 grams (3.2 percent) of iron dicyclopentadienyl in ml. of a typical household insecticide base oil. The tests made with this solution employed a dosage of IO-second discharge. An equilibrium :period of 15 seconds followed by an exposure period of 70 seconds, during which the mist was permitted to settle on adult house flies confined in a screen-covered dish, was employed in the tests. The results of the tests showed that of the flies which had been contacted with the base oil containing 3.2 percent by weight of iron dicyclopentadienyl, 53.6 percent were dead after 24 hours. Of theflies which were contacted with the base oil alone, only 13.0 percent were dead after 24 hours. Check flies which were confined for 24 hours without having been contacted with either the base oil or the base oil containing iron dicyclopentadienyl had a death rate of only 0.4 percent. The better than fifty percent mortality of the flies treated with the base oil containing iron dicyclopentadienyl is indicative of the insecticidal properties of naphthas containing a small amount of iron dicyclopentadienyl. Naturally, the amount of metallo cyclopentadienyl used in insecticidal compositions-will vary with the particular compound employed and also depends upon the particular insects for which the spray is intended. The amount of iron dicyclopentadienyl employed in insecticidal compositions intended for use on flies is between about 1.0 and 10.0 percent by weight. Ya know, a greater than 50 % kill rate seems to be getting a bit sporty for the flies. The ol’ boys at Gulf were studying the suitability of a variety of ferrocene analogs for fuel additive application. What lead them to go from octane enhancement and smoke control to killing flies is not revealed in the patent. Notice the nomenclature in the patent language. The word ferrocene is not mentioned. Looking at the timeline we see that the Gulf ‘685 patent was filed April 21, 1952, not long after the publication of this curious iron cyclopentadienyl compound by two groups, Kealy & Pauson on 12/15/51, and Miller, Tebboth, and Tremaine on 1/1/52. Though Pauson and Keely published first, an examination of the papers show that Miller, Tebboth, and Tremaine were first to submit- July 11, 1951 vs August 4, 1951 for Pauson and Kealy. The day before Gulf filed the patent application, April 20, 1952, a groundbreaking paper by Wilkinson, Rosenblum, Whiting, and Woodward was published on the proposed structure of iron bis-cyclopentadienyl. It is reported that the name ferrocene was invented by Mark Whiting, a student of R.B. Woodward and coauthor of the 1952 paper in JACS. The name derives from the ferrous ion and the aromatic (“benzene”) nature of the cyclopentadienyl ligands. The curious structure was proposed largely on the strength of a single C-H IR band at 3.25 μ. Since all of the C-H bonds appeared to be equivalent, the only structure compatible with the formula, charges and symmetry was the famous η5 (eta five) sandwich structure. Later the word metallocene finds use for this class of substances. There is disagreement as to some of the details outlined above. An excellent article by Pierre Lazlo and Roald Hoffmann navigates some of the narrower channels in the history of ferrocene. It is well worth the read. Lazlo & Hoffmann suggest that Woodward is thought to have conceived the sandwich structure. Ferrocene and derivatives would soon prove useful in many areas. A more obscure application is found in the field of rocket propellant additives and function as burn rate stabilizers. In fact, certain ferrocene derivatives appear on the US Munitions List, 22 CFR 121.1, Category V, (f)(4) Ferrocene Derivatives. A good overview of ferrocene and other metallocenes can be found in Wikipedia. Circling back to the beginning of this piece, the patent application for Gulf ‘685 was filed 4/21/52, only 4 months after the publication on 12/15/51 of the Pauson & Kealy paper and two weeks later the Miller, et al., paper on 1/1/52. In the 4 months between Pauson & Kealy and the Gulf patent filing, two independent groups had published papers reporting the preparation of iron dicyclopentadienyl by different methods, a Harvard group had postulated a structure for the compound using IR data and a novel bonding type, and the Gulf R&D group had produced various analogues for testing as fuel additives. In this short time interval, the first organo-iron compound was taken from a literature source through industrial R&D and a patent application. As a premium, Gulf even determined that it had insecticidal properties. Much happened in a short time. I have spent some time researching basic magnesium chemistry. Not anything synthetic but more safety and thermochemically related. I am not able to give a lot of particulars motivating the study, but I can say that one should consider that nitrogen over activated magnesium may not be as innocent as you think. 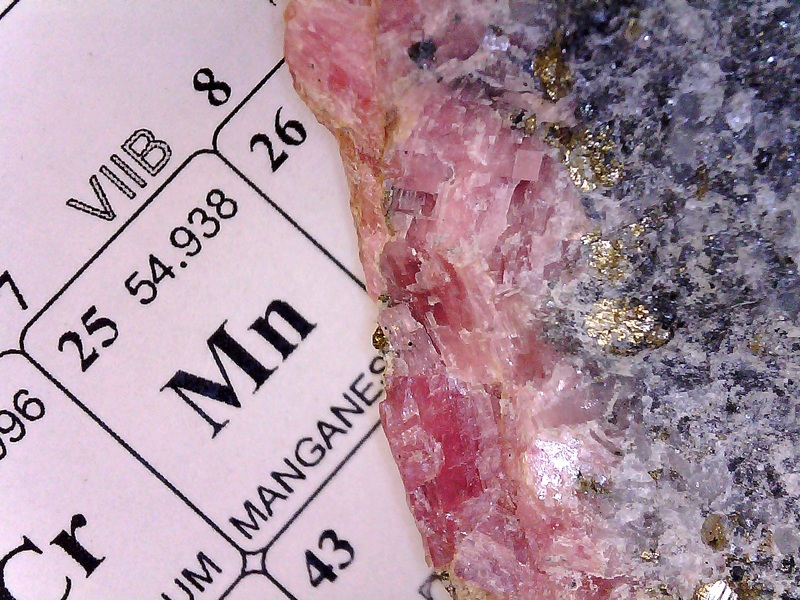 While lithium is widely known to react with nitrogen gas to form a passivating nitride layer, the reaction of dinitrogen with magnesium is rarely encountered. Activated magnesium residues from a Grignard or other magnesium metallation reaction may self-heat to incandescence under a nitrogen atmosphere in the right circumstances. Activated residues left isolated on the reactor wall or other features in a nitrogen blanketed reactor during an aqueous quenching procedure may self-heat to incandescence. In the presence of reactive gas-phase components like water vapor in nitrogen, activated metals can self-heat over an induction period of minutes to hours or longer. Many metals, including magnesium and aluminum, can be rendered kinetically stable to air or humidity by the formation of a protective oxide layer. Once heated to some onset temperature by a low activation reaction, penetration of the protective layer by reactive gas composition can occur, leading to an exothermic reaction. Performing a “kill reaction” or a quench of a reactive metal at the bench or at scale is always problematic and requires the skill and close attention of the process chemists and operators. I guess what I’d like to pass on is that nitrogen is not an innocent spectator in the presence of finely divided, activated magnesium. Humid nitrogen can support a combustion reaction to produce nitrided magnesium once preheated to an onset temperature. If you mean to kill any reactive residues, it is important to apply the quenching agent in such a manner that the heat generated can be readily absorbed in the quenching medium itself. A good example of a quenching agent is water. Often a reactive must be killed slowly due to gas generation or some particular. Adding a quenching agent to a solution or slurry by slow feed or titration may be your best bet. If you have another vessel available, a feed to a chilled quenching agent will also work. Dribs and drabs of water on a neat reactive material will lead to hotspots that may be incendive. After a weekend in the Alma, CO, mining district, I have come around a bit on the merits of gold mining. Oh sure, I have always known that it was a dirty business, what with the mercury, the cyanide, the acidic tailings piles, and the blighted landscapes. But for God sakes man, it’s GOLD! Last weekend was different. It wasn’t a dispassionate examination of mining history. I could see miles of blighted landscape heaped with spent alluvium along the road from Fairplay to Alma. To the north, over Hoosier Pass, are the McMansions of Breckenridge where new and old wealth mingle. To the south of Fairplay is a sizeable expanse of gravel and cobble heaps from past placer mining. 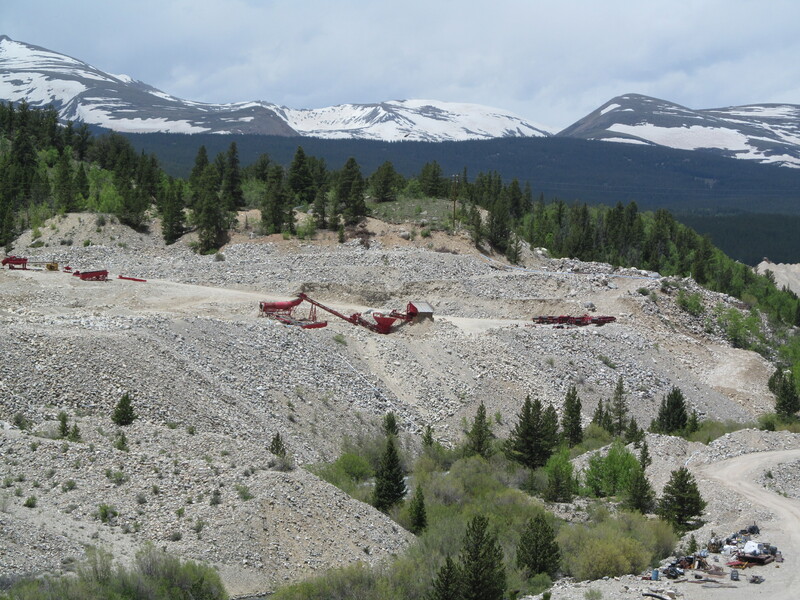 The photo shows just a short stretch of the creek bed undergoing placer mining on the north end of Fairplay. Granted, the mining company is using gravity separation by way of the sluice to recover the gold. The stones are all rounded and well weathered, so one might expect the tailings to release little in the way of toxic leachate. But what a colossal mess they have made of the landscape. Perhaps they have put up a bond assuring that restoration of the landscape will happen when the mining ceases. I don’t know. That does not seem to be the way of past mining in the district. My point is this. Isn’t there some madness in gold mining? At best a handful of people get wealthy from putting more gold on the market. I would argue that gold does not have the utility of iron, aluminum, or copper for instance. It does not go into items that advance civilization and economics like tractors, bridges, ships or wires. Gold does not go on to enable the growth of industry in the manner a base metal. Some of it adorns our fingers but most falls into the hands of anonymous individuals and governments who hoard vast caches of the metal. Granted, a bit of the annual production goes into electronics and a few other applications. The madness in gold mining is that people are willing to go to any length or bankrupt themselves to obtain a metal that in the end benefits approximately no one. Most of the metal will quietly sit in a vault somewhere producing nothing. It won’t support a building or a roadway over a river. It won’t produce goods or services, nor will it bring a silent heart back to life. It can only support abstractions like the notion of value. We’re willing to put up with scarred landscapes, mercury pollution and acidic runoff produced by other people for an abstraction. That is pretty funny. I’m a fan of Gold Rush on the Discovery Channel and have been since the beginning. Aside from the producers constant over-dramatization and spreading the content a little too thin over the time block, I’d have to say that my main criticism would be with the miners themselves. What I would throw on the table is the observation that there is a troublesome lack of analytical data supporting the miner’s choices of where to dig a cut. The few episodes where core samples have been taken, useful data was obtained and decisions made therefrom. But the holes were paid for grudgingly and the range covered too miserly. A sufficiently capitalized operation would be sure to survey the ore body and make the decision to bring in the heavy equipment on the basis of data. Obviously they have been chronically short of capital for their operations. Fortunately for them, over the last 2 seasons they have been able to upgrade their wash plants, trommels, and earth moving equipment. Must be the TV connection. But I suppose it is the very lack of capitalization that forms the dramatic basis of the show. Without scarcity there would be no drama. Without the conflicting personalities and dubious decision making there would be only a documentary on gold mining. I have to imagine that the recent collapse in gold prices will get folded into the dramatic context in the next season. I truly wish Parker Schnabel, the Hoffman crew, and the Dakota boys the best of luck in their efforts. What the viewers can’t see are the 10,000 details and problems that remain on the editing room floor. Why not encourage Iran and other states to develop thorium-based nuclear power? It is a crying shame that we (the rest of the world) did not think to encourage Iran and other states to develop thorium-based nuclear power many years ago. The thorium fuel cycle provides nuclear-powered steam generation, but is largely absent the use of fissile isotopes in the cycle which may be used for nuclear proliferation. Thorium-232 is more abundant that uranium-(235 + 238) isotopes and does not require isotopic separation as uranium does. The great exploration boom in progress with rare earth elements would facilitate thorium supply. 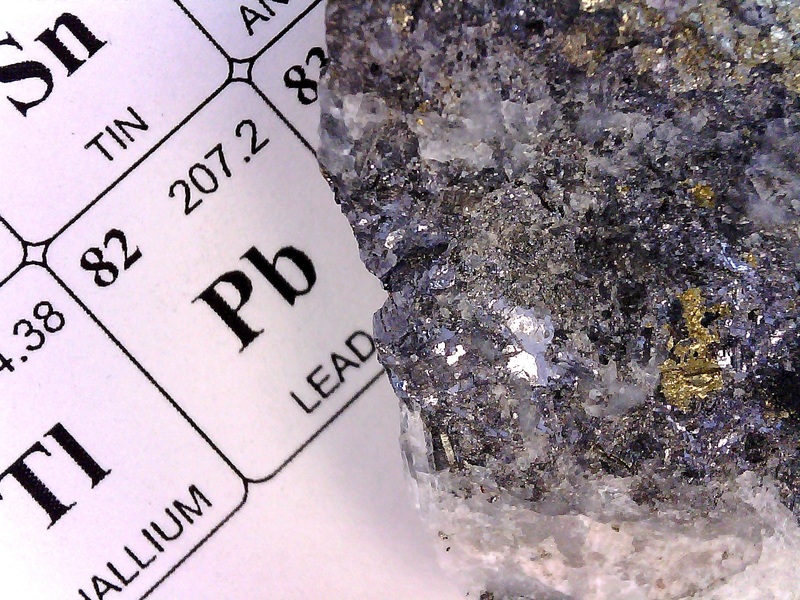 Thorium and uranium are commonly found in rare earth ores and, to the dismay of extractive metallurgists since the Manhattan Project, these elements tend follow along in rare earth extraction process. The isolation of thorium was developed long ago. Point is, since so many rare earth element extraction process streams are either in operation or are pending, now is the time to accumulate thorium. At present however, thorium is a troublesome and undesired radioactive metal whose isolation and disposal can be quite problematic. The best process schemes partition thorium away from the value stream as early in the process as possible and channel it into the raffinate stream for treatment and disposal in the evaporation pond. The specific activity of natural thorium is 2.2 x 10^-7 curies per gram (an alpha emitter). The specific activity of natural uranium is 7.1 x 10^-7 curies per gram. Alpha emitters pose special hazards in their handling. Dusts are a serious problem and workers must be protected especially from inhalation or ingestion. While alpha’s are not difficult to shield from, their low penetration through ordinary materials or even air makes them a bit more challenging to detect and quantitate relative to beta’s and gamma’s. In spite of the mild radioactivity of thorium, managing the occupational health of workers is known technology in practice in the nuclear industry. Regrettably, most of the world’s nuclear power infrastructure is geared to uranium and plutonium streams. Thorium, the red-headed stepchild of the actinides, is thoughtlessly discharged to the evaporation ponds or to the rad waste repository- wherever that is- to accumulate fruitlessly. If we’re digging the stuff up anyway, why not put it to use? It is a shame and a waste to squander it. The founders of the Silicon Valley startup, Planetary Resources, have announced plans for mining asteroids for valuable metals. Peter Diamandis, Eric Anderson and investors including director James Cameron and Google CEO Larry Page are behind this venture. I’m trying to be positive here. Perhaps these fellows should visit some earthly mines and see what it takes to break actual rock and extract the value from it. Earth bound ore bodies near the surface are commonly the result of concentration by hydrothermal flows. In the absence of water-based geothermal concentration processes, or recrystallization of PGM’s in magma chambers, the reality of economically viable ore bodies in asteroids is an open question. A lot of survey work needs to be done to answer this question. Oh, and one more thing. When you blast rock on a largish planet like earth, the fragments fall back to the ground. This won’t happen on an itty bitty asteroid. The talk about recovering water from asteroids to subsequently crack and make propellant is a large challenge all by itself. Agilent MP AES. The New AA. Agilent is excited about their new 4100 MP-AES system. The initials stand for Microwave Plasma Atomic Emission Spectrometer. The instrument uses the magnetic component of the microwave energy to produce a nitrogen plasma at ca 5000 K, through which the sample is drawn. The monochrometer looks down the axis of the plasma torch. The detector is constructed to suppress blooming. Pretty cool instrument. The setup includes a nitrogen supply which separates the nitrogen directly from air, so there is no large argon dewar to lug to remote locations like mine sites. The MP-AES is designed to compete in the AA market. The detection limits are comparable for many elements. The kicker is that there no need for combustion gases or element specific lamps since it is a plasma emission method. The question I have is this- is there any market left in the replacement of AA? The instrument sells for $53 k, so the pricing is very competitive with or better than ICP. I think that argon based ICP is going to feel the heat of this nitrogen plasma torch. The bad news for chemists is that you don’t need a chemistry degree to run it. To set up methods, maybe, but the software is designed for operation by non-degreed techs. Rhodochrosite is a mineral composed of MnCO3. The specimen above is in no way exceptional, other than as a curio. 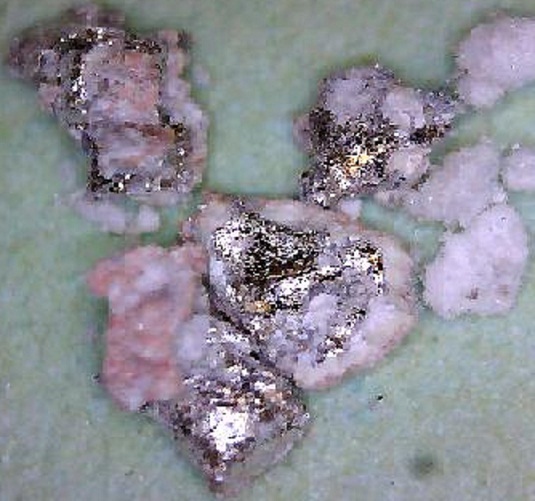 The mass is comprised of rhodochrosite, galena, pyrite, what looks like quartz, and possibly a trace of a gold colored metal. The photo below shows the galena, or PbS. The photos were taken with a USB microscope.